Terrorist attempts to enter Jerusalem several times, is arrested before carrying out attack. Border police units patrolling the area of the Qalandiya Crossing on the outskirts of Jerusalem arrested an 18-year-old Arab woman attempting to carry out out a terrorist attack. 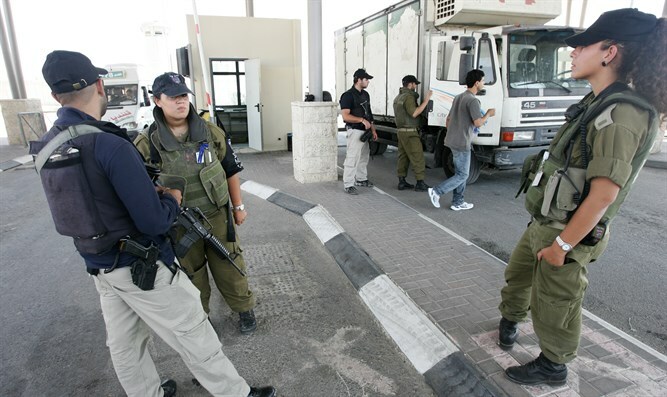 The suspect attempted to pass through the Qalandiya Crossing without proper papers and was turned away. A short while later, the suspect again tried to pass through the crossing using her seven-year-old sister's passes. The suspect then attacked the officers and attempted to cross through the checkpoint by force. She was arrested and taken for questioning, where she admitted to carrying out a terrorist attack in the Jerusalem area. The police said that "the soldiers and policemen work throughout the year at the crossings around the Jerusalem area and in their activities constitute human shields for the residents [of the city], prevent the entry of unauthorized persons into Israel and the smuggling of weapons. This is all in order to protect the residents of the State of Israel."